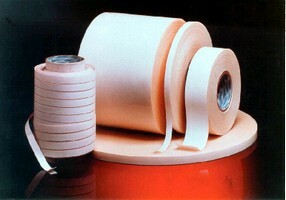 Pressure-Sensitive Tape provides uniform bond. Available on rolls in widths from 3/16-18 in. translucent, acrylic Model PHB3000 provides uniform bond between virtually any substrate, including intricate shapes, glass, and other clear materials. Able to withstand weathering, moisture, and wide temperature range, tape will not harden or become brittle with age. It is also effective in dampening vibration, sound, and shock. Tape comes in thicknesses from 0.025-0.08 in. and lengths up to 216 ft.
ADDISON, IL, May 15, 2007 - Pres-On, a leading supplier and innovator in adhesive products, is offering OEMs its new PHB3000 translucent acrylic pressure-sensitive tape, designed to provide a uniform high bond between virtually any substrate, including intricate shapes, glass and other clear materials. Pres-On PHB3000 is ideal for signage, skin-to-frame assembly, furniture and appliances, and is especially effective in attaching auto trim. It is approved by GM, Chrysler and Ford specifications. Able to withstand weathering, moisture and a wide temperature range, the tape will not harden or become brittle with age, so it can be used with confidence to replace mechanical fasteners or welds. In addition, it is highly effective in dampening vibration, sound and shock. Pres-On PHB3000 is available on rolls in widths from 3/16-inch to 18-inches, with thickness range from 0.025 to 0.08 inches and lengths up to 216 feet. For a free sample, phone 800-323-7467. On the web, www.pres-on.com. E-mail: sales@preson.com.